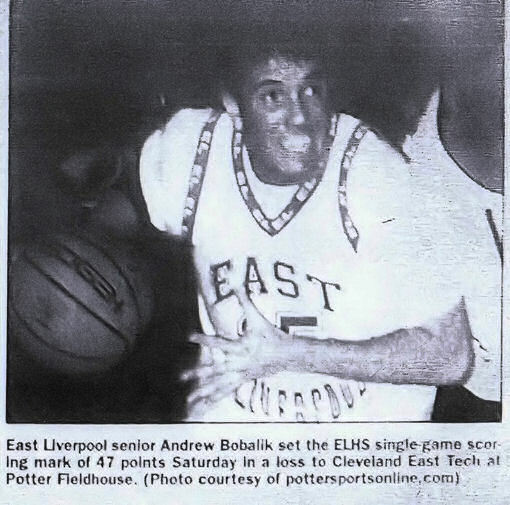 Some of the old ELHS grads will remember the banner days of basketball, going all the way back to the mid-1940s when East Liverpool High School made its presence felt in the state semi-finals, appearing two consecutive years. However, until two years ago, during the 1989-90 campaign and again this past season, no Potter squad had reached the regional tournament level for 44 years -since those glory days of 1945-46 and 1946-57. The latest edition of the Blue and White compiled one of the outstanding records in the history of the sport at the city school, winning 20 games, including three in the tournament, and losing only four. In the Forties, the Potters had such greats as Jim Harris, Walt Ashbaugh, the late Al Bailey, Jerry Hyder and Alex Cunningham, while the coaches were Don Ogden and Merrill Hall. Ken Cunningham had been Ohio's "Player of the Year" in 1961 setting a new single game scoring record with 40 points as well as other records. But in the 90s, the name of Mike McFarlane has been deeply engraved into ELHS record books. The senior guard, standing a shade under six feet, broke every school scoring mark this past winter. The above is incorrect in one area. Webmaster ELHS Web Site. 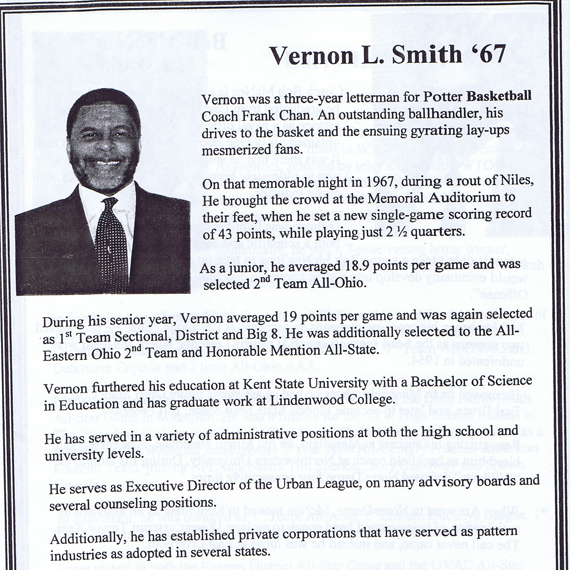 His 44 points against Oak Glen (W.Va.) set a single game record held by Vern Smith with 43. McFarlane's season total of 480 points in 20 regular games erased the record once held by Ken Cunningham. His three-year total of 1126 did pass the 1102 by Cunningham who was Ohio's "Player of the Year" in the early 1960s. 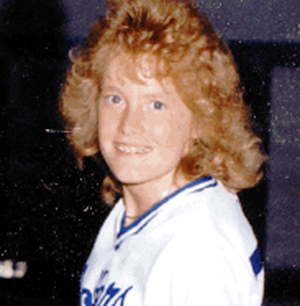 However, Wendy Baker set a new school scoring record for boys and girls with her career points of 1153 in 1989. For McFarlane's efforts he was named the Eastern District "Player of the Year," and was the recipient of the Hi-Y Award. 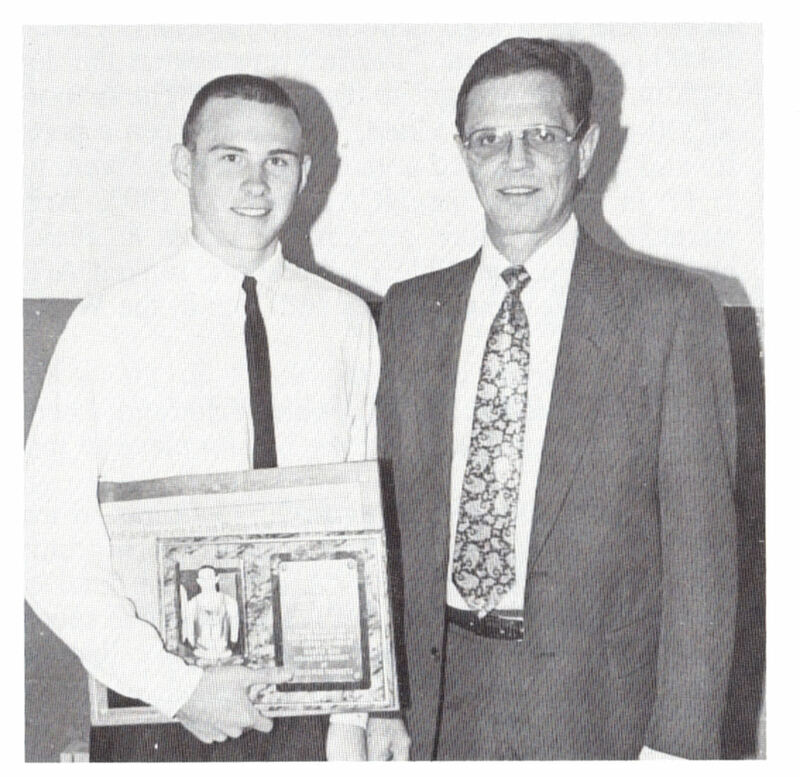 During the 1991-92 basketball season, Mike McFarlane (left) shown with former Potter standout Ken Cunningham, broke all the scoring records at East Liverpool High School. McFarlane scored 1,126 points during his three- year career, bettering Cunningham's old record of 1,102. He also set a new season record which Cunningham held and a single game high of 44 points formerly held by Vern Smith of 43. The above picture should have, at the very least included Wendy Baker as well since she was the one who had actually broke Ken Cunningham's school career scoring record. The Review also had it wrong: It was brought to our attention by Ruby A, Weymouth ELHS class of '86. : When Mike McFarlane finished his career with 1,126 points it was initially put in The Review that he had became the all time scoring leader. A couple of days later the Review put in a correction stating that Wendy Baker was the all time scoring leader with 1,153 points. But it wasn't until 1997 that Steve Flores surpassed her point total. The review at that point placed a picture in the paper of Wendy giving Steve balloons congratulating him. You will note that the above article gives Wendy's career scoring total as 1,129. Where that number came from is totally unknown. 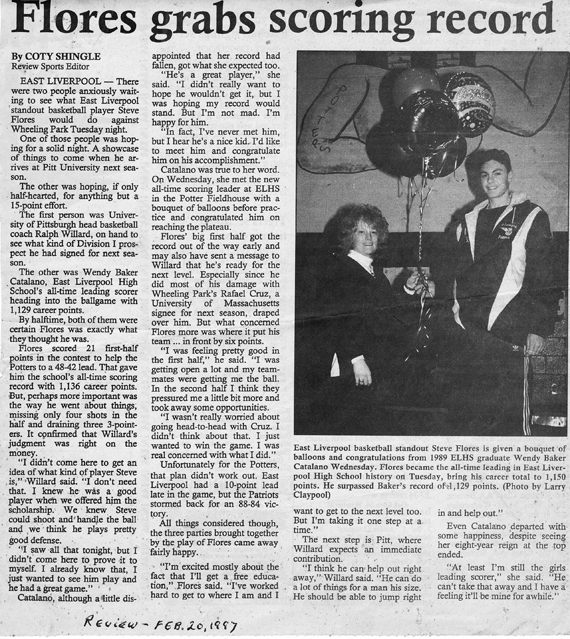 Two newspaper articles (Steubenville Herald and Wheeling Intellingencer, published August 26, 1989, just two months after she graduated from ELHS, gives her career scoring total as 1,153 which is the accepted number now. To the ranks of top coaches add the name of Nick Aloi, a native of Midland, who in three sea-sons led the Potters to a pair of district titles and into the Regional Tournament. Eric Rogers, Brian Smith, Walt Long and Nate Boyd rounded out the starting five for the notable city team. This past season, East Liverpool played two tournament games on their home floor, hosting the Sectional Basketball Tournament for the first time at the spacious fieldhouse on the hill, one of the finest facilities in the state. The Potters battled through three tournament games, winning the Sectional championship with an 81-71 victory over Buckeye Local, and defeating Chillicothe 68-62 for the District title before bowing out to Lima Senior 84-76 in the first round of the regional's at the Columbus Fairgrounds. Incidentally, it was at the Fairgrounds during the 1947 state championship games where another East Liverpool team, after defeating Findlay 35-32, reached the state finals for the only time in the school's history, but lost 47-29 to Middletown in the title contest. Coach Alio congratulating Andrew Bobalik after he broke the single game scoring record. Liverpool's Cunningham Scores 51, January 12, 2014, The Intelligencer / Wheeling News-Register, East Liverpool 97, Cameron 61, CAMERON - Hayden Cunningham scored a school-record 51 points to lead East Liverpool to a victory. He had 30 at the half, as the Potters took a 56-25 lead. 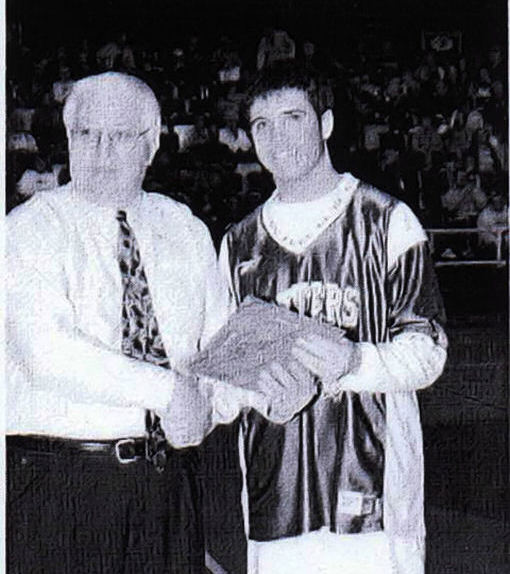 In 2005 Brian Kreefer became the all time-scoring leader at East Liverpool. The senior tallied 1384 points in four seasons at ELHS. The Previous mark was set by 1997 grad Steve Flores. Kreefer was an Associated Press Division II All-Ohio first-team selection. The 6-7 forward was the seventh East Liverpool player named all-state first team, and the second under head coach Nick Aloi. Dan Swoger, class of 1999 was the other. 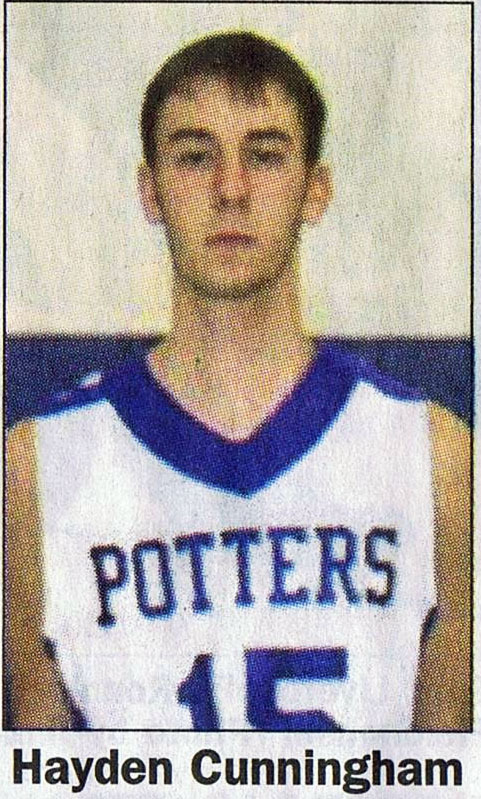 Kreefer, a four year starter, led the 20-3 Potters this past season with 27.4 points a game and 13 rebounds. He scored 548 points in 2004-05. Kreefer scored at least 30 or more points nine times and 20 plus 16 times this year. He led the team with 42 three point goals. Besides being recognized on the state level, Kreffer was the Division II Eastern District Player of the year, Division III District 5 Player of the Year and Columbiania County Player of the year. Ken Cunningham was inducted into the ELHS Athletic Hall of Fame in 1982, Wendy Baker was inducted in 1996, Mike McFarlane was inducted in 1998 and Brian Kreefer was inducted in 2005. Wendy Baker was inducted into the OVAC Hall of Fame in 2006. Ken Cunningham is being inducted into the OVAC Legends Catagory (Those who excelled in sports at their respective High School before their respective High Schools became members of the OVAC) in 2013. On Dec. 23, 2015 Nikayla Edgell joined Wendy Baker-Hoppel as the top two female scorers in ELHS Histoty. with over 1000 career points each. On Jan. 14, 2015 Nikayla Edgell passed Wendy Baker-Hoppel career total of 1153. * The boys basketball booster club which also publishes basketball program each year until 2012-13 only listed four basketball record holders: Mike McFarlane at 1,126 points, Stephen Flores at 1,191 Josh Reed at 1,305 points and Brian Kreefer at 1384 points. When it was pointed out to them that there should be two other people on that list, Ken Cunningham at 1,102 points and Wendy Baker-Hoppel at 1,153 points the list was altered in the basketball program for the 2013-14 season. For that 2013-14 Basketball season the list of boys (something new) basketball record holders. Career 1000 point leaders (also new). Included for the first time, Ken Cunningham and a new 1000 point member from the year before Marky Thompkins. However, they still did not include Wendy Baker who was a thousand point club member and had been since 1989. She had even been the top East Liverpool high school basketball scorer from 1989 to 1997. They have every right to structure their publication in any way they want. After all, it is the boys basketball booster club. Apparently there isn't a girls basketball booster club or if there is it doesn't have the same clout and resources as the boys basketball booster club. It is a shame that they don't just have a basketball booser club. The boy booster club program does include a lot of boys individual records , win, loss records of the boys coaches and other such data. They do include team pictures of the girls teams, class pictures of the players, i.e. freshman, sophomores, juniors and seniors. It does include girls coaches and bios of the coaches. It does include the girls schedules. That is about it. Now, perhaps since there are now two girls in the thousand point club both of them will now be included in the future programs. There was no 3 point rule or line when Ken Cunningham played basketball at ELHS, nor did freshman play varsity ball. He got his 1102 points in 3 years. Nor was there a 3 point line or rule for a portion of Wendy Baker's playing days at ELHS. As of this date, December 12, 2013 the top HS basketball record holder in the state of Ohio is Marlene Stollings, Beaver Eastern (1989-1993) with 3514 points. 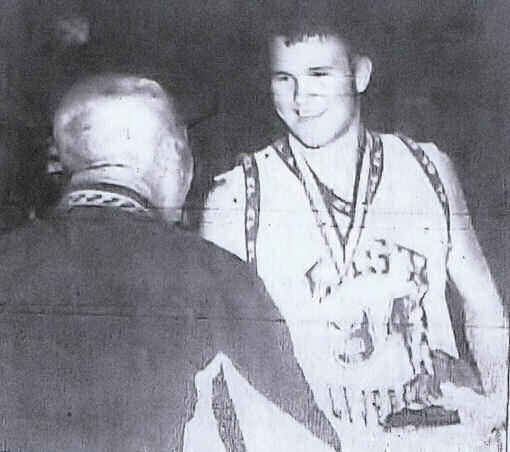 In second place is Jon Diebler, Upper Sandusky (2003-2007) with 3,208 points. The basketball size is different for the girs game and the boys game. Girls use a slightly smaller basketball in high school -- 28.5 to 29 inches in circumference and 18 to 20 oz. in weight. The boys' basketball is 29 to 30 inches in circumference and 20 to 22 oz. Everything else is the same for the girls and boys game. The basket is the same height, 10 feet high. The 3 point line is the same the free throw line is the same. The girls play on the same court as the boys.